The Hope is another Richmond pub that I was visiting for the first time yesterday. I was already a little bit drunk by the time I arrived yesterday. But my lasting impression of this place was a light and airy space around a central bar. There were 3 ales - Gales Seafarers, Youngs Bitter & By The Horns Stiff Upper Lip. 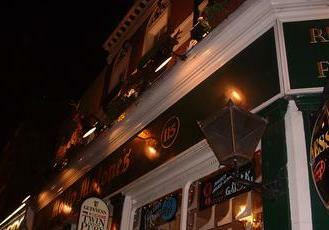 This pub is also rather unusual in Richmond in serving a real cider. This was Orchard Pig Explorer. Better than the many Fullers & Youngs pubs in Richmond, despite serving 2 of their ales! Welcome back The Hope. Never thought that we could ever get rid of Molly's. Now a decent pub and well worth a visit if you want to try somewhere a little different from the usual type of high street pub. I like this bar because it is different to the norm and also (possibly unfortunately for the people running it) it tends to be fairly quiet. As ever for me in Richmond this is mainly based on daytime rather than evening visits though so it may be totally different later on. High(ish) proces but I guess that is normal for the location.